Corrosion. As boat owners, we soon learn that the battle against corrosion is never-ending. It is a battle that we fight day after day, month after month, just to keep from falling behind. Engine room parts corrode. Propellers and shafts corrode. Wiring and electronics corrode. We polish and paint, varnish and clean, pushing back the evil forces of corrosion wherever we find them. But did it ever occur to you that corrosion might be eating away at the coverage you expect from your marine insurance policy? On March 25, 2008, the Aqua Novia, a 74-foot Sunseeker yacht was moored to her dock. The conditions were calm. 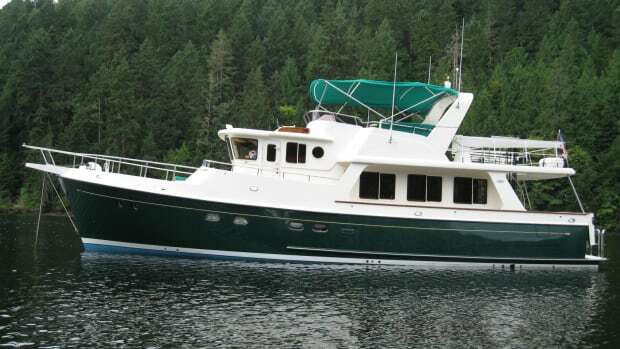 A hose barb circulating sea water to the air conditioning system failed and water began filling the vessel, partially sinking her at the dock and causing over $1.2 million in damage. The Aqua Novia was insured under an “all risks” policy by St. Paul Fire and Marine Insurance Company. The owner filed a claim under the vessel’s marine insurance policy. The court also found that the manufacturer’s use of yellow brass (See PMM’s newsletter article, “Don’t Fall for the Brass Line” at http://www.passagemaker.com/subscriptions/channels-e-newsletter/item/1513-don%19t-fall-for-the-brass-line for more on this type of insidious corrosion) for the hose barb was not covered by the term “manufacturer’s defect” in the marine policy. The manufacturer knew that exposure of yellow brass to sea water created a condition likely to cause corrosion. However, the court concluded that the term “manufacturer’s defect” in the policy meant “a defect in the manufacturing process” not a design defect, such as the specification and use of an inferior material, like yellow brass, in a hose barb exposed to sea water. The vessel’s owner appealed and the U.S. Circuit Court of Appeals held that the district court had improperly limited the term “manufacturer’s defect” to exclude design defects and remanded the case back to the trial court for additional evidence concerning the possible manufacturer’s design defect in choosing and installing a yellow brass hose barb. After the case came back to the Florida District Court from the Court of Appeals, the lawyers for St. Paul successfully argued that the court need not determine whether or not the use of a yellow brass hose barb was a “manufacturer’s defect” because, even if the manufacturer could have selected a better material for its hose barb, the cause of the sinking was corrosion—corrosion of the yellow brass hose barb—and any type of corrosion was excluded from coverage by the policy. The owner filed a second appeal, but was unsuccessful. Thus, after the second appeal was rejected, the owner was left with more than a million dollars in uninsured damage to the Aqua Novia, substantial legal fees and costs, and as a final insult to add to his injury, the owner had to pay St. Paul insurance more than $20,000 for its costs in bringing the lawsuit. Is this just the maritime legal system run amok? Is it an owner being mistreated by his marine insurance company? No. Your marine insurance policy is a contract. Admiralty courts traditionally apply “strict construction” rules to marine insurance policies. Your insurer priced your policy based on what was covered, what was excluded, and the insurer’s assessment of the risks being insured. Even an “all risks” policy has exclusions. If “corrosion” is excluded from your insurance coverage, and a corroding hose barb, seacock or through-hull valve fails and sinks your boat, you may find that you do not have the coverage that you assumed you had. How can you tell? Go get your boat’s marine insurance policy and read it, especially the exclusions. If you don’t understand exactly what is and is not covered, ask your marine insurance broker to summarize the coverage and exclusions for you in writing or bring your policy to a qualified maritime lawyer for a review of the coverage and exclusions in your specific policy.